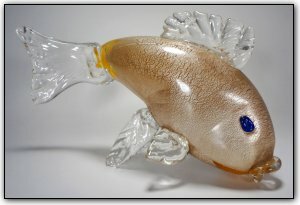 This hand blown and sculpted gold fish features an amber hue and blue eyes, and a luxurious real Japanese sterling silver body wrap. It also features carefully and detailed transparent glass fins and tail to give it a very life like appearance and it stands very sturdy without the need for any external support. The goldfish represents the feeling of swimming through life, and adds movement and life to any room.